FC Barcelona managed to keep up the pressure on La Liga’s top two of Real Madrid and Sevilla with a 4-0 win over Eibar at Ipurua on Sunday evening. Denis Suárez sent Barça on their way with a fine strike from distance in the first half before the front three of Leo Messi, Luis Suárez and Neymar Jr sealed a comfortable win. It was a disappointing start to the game for Barça, as Sergio Busquets left the field after just ten minutes following a harsh tackle. The Catalans’ first strike on goal was a Messi free-kick that went just over the bar. Soon after, a magical dink over the top from Messi played Suárez through but the striker could not keep his effort under the bar. On 25 minutes, Marc-André ter Stegen got down well to push the effort of Adrian away with his right hand and the German keeper was again made to work seconds later but this time Pedro León’s strike was more straight forward. The breakthrough came just after the half-hour mark when the ball fell to the feet of Denis, who replaced the injured Busquets – the midfielder hit the ball first time from the edge of the box and arrowed it perfectly into the bottom corner for 1-0. It was the 23-year-old’s first senior goal for the club, and it was an impressive one too. 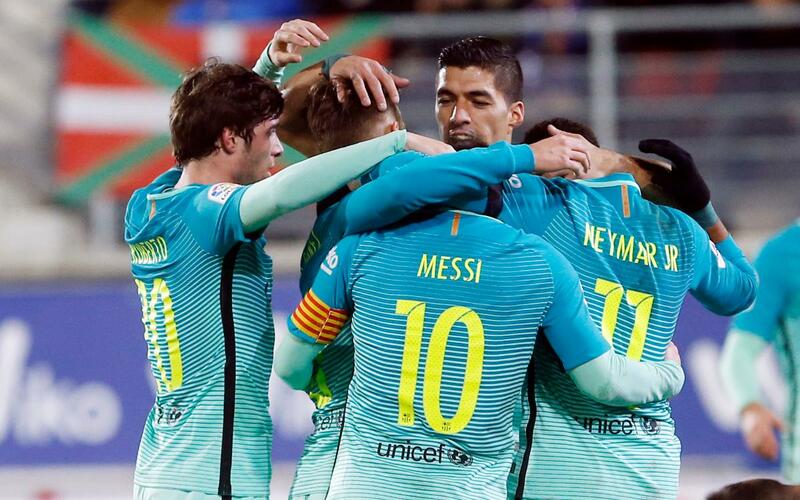 Barça were beginning to get into their rhythm as the half went on and it was so nearly 2-0 before the break. An eye-of-the-needle through pass from Messi played Neymar through on goal but the Brazilian saw his effort stopped by the keeper’s outstretched foot. And Barça again came close before the half-time whistle as Suárez was played through on goal but this time the post would deny the Uruguayan. But what they were unable to do in the closing stages of the first half, they managed at the start of the second. Suárez turned provider as his pinpoint chip in the box found Messi who had the composure to roll the ball under the onrushing keeper for 2-0. Messi now has six goals in his last five league outings and has netted five times in his three visits to Ipurua. Almost instantly, Eibar looked to have reduced the deficit as Adrian’s header flew past Ter Stegen into the far corner but the linesman’s flag would let Barça off the hook. It was Eibar who enjoyed more of the ball and the chances after Barça’s second but in pursuing a goal of their own, gaps soon appeared in their backline. In what appeared to be a lost cause, Suárez hustled Eibar defender Florian Lejeune off the ball before racing through on goal and calmly slotting home for 3-0. Eibar, to their credit, never gave up and continued to search for a consolation goal. With six minutes to go, Ter Stegen was forced into a top save as a rasping long range effort by Pedro León so nearly found its way into the net. In the last minute, the victory would be wrapped up in style as Neymar finished smartly after Aleix Vidal’s cross. In doing so, the Brazilian levels his fellow countryman Ronaldinho for number of goals scored in a Barça jersey, with 94. The win helps Barça keep up the pressure on the top two of Real Madrid and Sevilla who both won their respective matches over the weekend. Luis Enrique’s men are two points off the top and one away from the Andalusians. Barça now turn their attention to the Copa del Rey quarter final second leg against Real Sociedad which takes place on Thursday at the Camp Nou with the hosts carrying a 1-0 advantage from the first game.